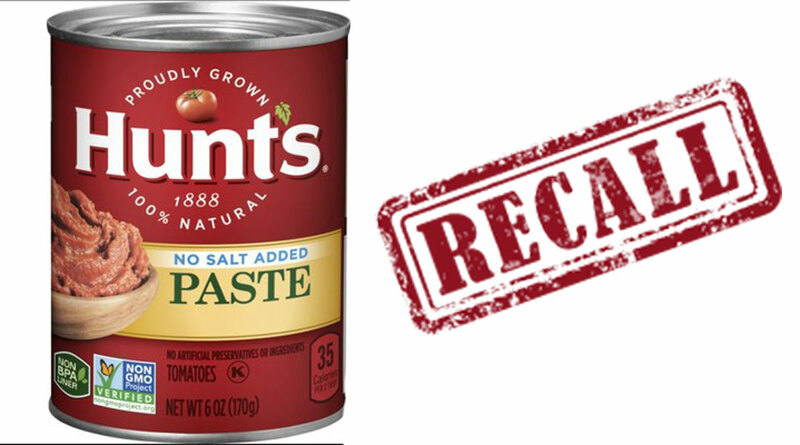 SAN ANGELO, TX -- Conagra Brands, Inc. has voluntarily recalled a limited amount of Hunt's Tomato Paste No Salt Added six ounce cans. The six ounce cans have a case UPC 00-0-27000-38809-9, an item UPC 00-0-27000-38807-5, case batch 5291902510, item batch 2105902510, and best by date of OCT 16 2020. Conagra Brands has informed the FDA of this recall and is working with customers to ensure the impacted product is removed from store shelves and is no longer distributed. Consumers with questions should call our Conagra Brands Consumer Care team at 1-888-280-0301, open 9 a.m. through 5 p.m. ET, Monday through Friday or visit the Hunt's website.